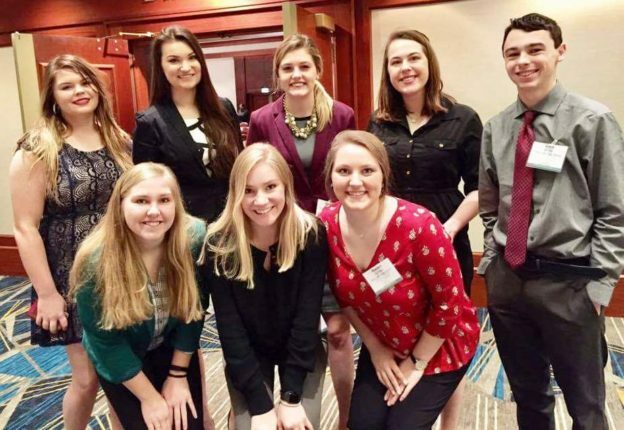 Attending the Illinois FBLA State Leadership Conference held in Springfield on March 25 were (front, left to right) Kara Ratermann, Dani Dant, Rachel Zurliene; (back, left to right) Hunter Lee, Maya Beckemeyer, Riley Pruitt, Emma Breiner and Zach Honer. From their test scores for the Illinois FBLA State Leadership Conference, the following Mater Dei students qualified for the National FBLA Leadership Conference in Anaheim, CA, June 29 through July 2: Corynn Henrichs – 1st place in Database Design and Applications, Zach Honer – 3rd place in Insurance and Risk Management, Sarah Kniepmann – 2nd place in Spreadsheet Applications, Sophia Lager – 2nd place in Computer Applications, and Kara Ratermann – 3rd place in Word Processing. The following students also earned recognition: Tori Arentsen – 8th place in Accounting II, Dani Dant – 7th place in Accounting II, Ben Kassen – 8th place in FBLA Principles and Procedures, Anna Knebel – 6th place in Personal Finance, Ben Logullo – 5th place in Networking Concepts, Alexis Patton – 5th place in Introduction to Parliamentary Procedure, and Mitchell Wilke – 9th place in Business Calculations. We thank FBLA moderator Mrs. Heather Land for her dedication to our students.